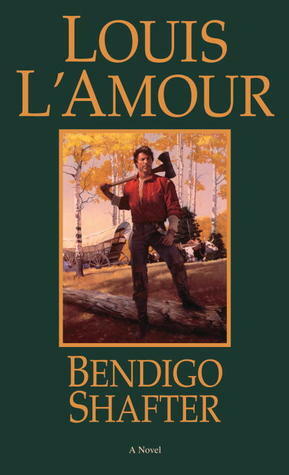 Bendigo Shafter isn't considered one of the books in The Sacketts series by Louis L'Amour because it isn't a story told from the first-person point-of-view of a Sackett character. However, one of the supporting character's is Ethan Sackett (and he's my favorite of all the Sacketts). At what point does a group of strangers become a community? When young Bendigo Shafter and a ragtag bunch of travelers settle in the rugged Wyoming mountains, they quickly come to depend on a toughness and wisdom many of them never knew they possessed. Led by the beautiful and resourceful widow Ruth Macken, the settlers battle harsh winters, renegade opportunists, and the destructive lure of gold. Through these brutally demanding experiences, young Bendigo is forged into a man. But when he travels to New York to reclaim the love of Ninon, his childhood sweetheart, Bendigo is faced with new challenges. Will hard-edged instincts, honed from years in the mountains, serve him in the big city? Does Ninon’s heart belong to the lights and glamour of the theater? And if his destiny deems it so, will he be willing to leave the community he toiled so long and hard to build? This is one of my favorite L'Amour books. Is it the best written? No. Could L'Amour have fleshed out and delivered more complete scenes? Certainly. Do I wish that the book ended as strongly as it starts? Yup. What I love about this book is the feeling that L'Amour creates for a place. Hiraeth: a homesickness for a home you cannot return to, or that never was. And I might be biased. I remember taking turns reading this book with my grandfather, as we passed the time during the weeks between Thanksgiving and Christmas. I loved the book then and I love the book now.